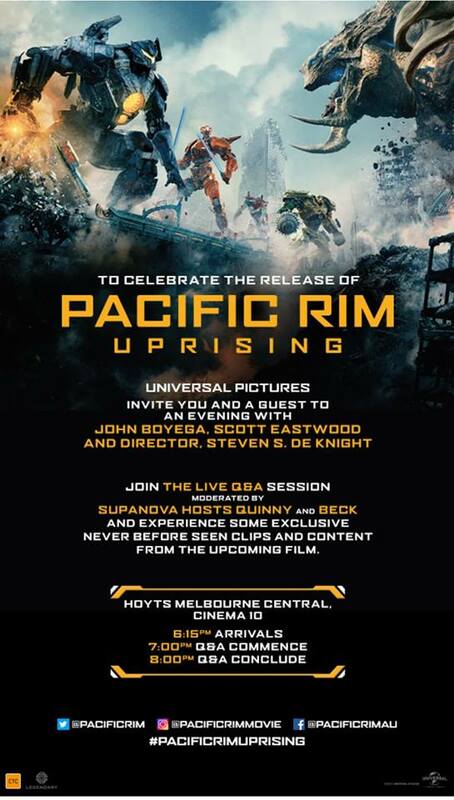 Supanova Comic Con & Gaming has reached out to us with an invitation to this special event for Pacific Rim Uprising on Wednesday 28th February in Melbourne. The Director, Steven S. DeKnight and 2 of the films stars – Scott Eastwood and John Boyega – are coming to Australia just for this event! The event will happen simultaneously in Sydney and will be streamed to Melbourne and Brisbane! If you want to go, please send an email BY 11PM TONIGHT with your name, contact number amd number of tickets you’d like to events@newmelbournebrowncoats.com. RSVP closes at midnight Monday 26 February. Space is limited and we can’t guarantee how many seats we can secure. See the invitation for all of the information. Seats to the event are limited and will be allocated to first responses.